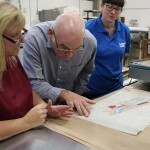 Our Heritage team recently took a trip to conservation specialists, Riley Dunn & Wilson Ltd. in Falkirk, to see how our special collection of historic maps and documents are being restored to their former glory. 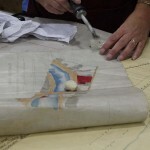 Riley Dunn & Wilson Ltd. are specialists in book and paper conservation who provide conservation and heritage presentation services to Scottish Canals. Most recently, RD&W have been restoring and digitising some of the oldest maps, plans, and other records in the Scottish Canals archive. Amongst the restored items are the original plans for the creation of the Caledonian Canal, signed by lead engineer Thomas Telford, and the diagram for the Monkland Canal’s Blackhill Inclined Plane – a precursor to The Falkirk Wheel, which carried boats over a height difference of almost 100 feet. 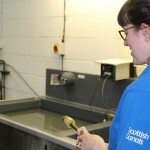 Scottish Canals’ Heritage Manager, Chris O’Connell, Records Manager, Angharad Stockwell, and Chris Fear, Marketing Trainee, paid a visit to RD&W’s conservation studio in Falkirk to find out how their specialists are helping to preserve our Scottish canal heritage for future generations. After fuelling up on coffee and biscuits, we were introduced to Lynn to see the first stages of the restoration process in action. 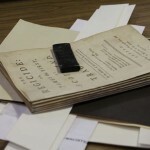 This involved surface cleaning – lifting away dust and dirt from the paper by gently wiping the surface with a dry archival sponge or vinyl eraser. 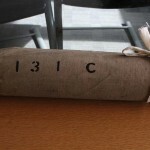 If a plan is found to be brittle or weak, then the next stage is to reinforce it by backing with material such as Japanese tissue – a thin but strong paper made from vegetable fibres that is widely used in the paper conservation. The two nineteenth century Union Canal plans that Lynn was working on were relatively clean and in good condition, and so this is where the cleaning process ended. However, one had a slight tear in the corner that Lynn repaired using polyester film. 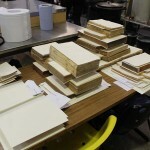 Finally, the two plans were flattened using a large heated press. 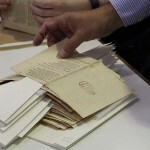 We were then introduced to the book conservationists, who were busy cleaning, repairing, sewing, and rebinding some beautiful books from the British Library’s collections. We also saw the large sinks and other equipment used by the conservationists to wash and de-acidify paper. De-acidification, or alkalization, combats acidity in paper that can cause it to decay over time. At RD&W, alkalization is achieved by immersing the paper into large sinks containing an alkaline solution, which are then dried on large racks and flattened. 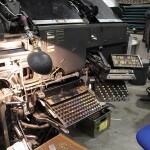 One of the highlights of the day was watching Tom operate the Linotype machine – the last one in operation at RD&W, and possibly one of the very few still in use in Scotland. 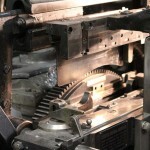 The Linotype is a typesetting machine that uses hot metal to cast blocks of metal type for use in printing newspapers, magazines, or posters. 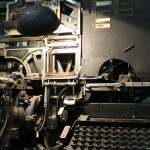 Today, the Linotype has largely been replaced by computer typesetting technology, and so it was fascinating to see this piece of printing heritage in action. Our final stop was to the bookbinding department, where we watched Jean work at lightning speed to cover a book with leather using adhesive. Jean has been with RD&W for over 50 years, and it was a pleasure to watch an expert craftsperson at work. 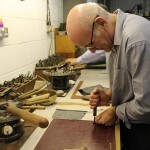 Scottish Canals would like to thank Colin McArthur and Brian Lynch for opening up the RD&W conservation studio to us, and for the conservation and bookbinding staff for being such informative and welcoming hosts.